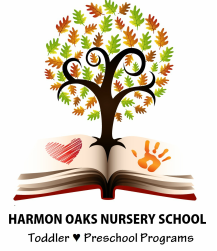 Harmon Oaks holds two family 'outings' during the school year and asks that parents make the time and effort to join us. We'd like our parents to meet the families with whom their children spend more than eights hours of their day. Aside from merely spending time together, our children have formed very close bonds and truly beautiful friendships. Let's celebrate their friendships and grow closer as a school family. For those of you wondering what we will be doing at the picnic, the answer is quite simple- we'll be spending time together. It's a very informal event where we enjoy the weather, eat with our families, have some light snacks and refreshments, play, talk, and play some more! Our teachers will be there with their families, so it's truly meant to be a large group 'playdate'... a nursery school playdate! Just as we have done in the past, we have also invited our newest 2020 Seedlets class, but this year again we will have very few new faces as many of our Seedlets are siblings of children already enrolled! We invite new families with hope that they can establish relationships prior to the summer term. Harmon Oaks only welcomes eight to twelve families each school year- I'm sure everyone remembers what it's like to be the "new" family. With that said, we're told that this picnic allows families to sever that "new" feeling quickly. We're always excited to officially welcome young siblings that have been patiently waiting to begin their journey at Harmon Oaks! While they are already apart of our school family, it will be quite a memorable day to see all our little ones together again. Four years ago, Katalina, Colette, and Elizabeth (present Bloomers) met for the first time as infants at the school picnic- Colette was only a few weeks old! There is metered parking along the perimeter of the park. Please bring plenty change for the meters as we would hate for anyone to receive a parking ticket. There is also unmetered parking along the side streets as well though it's a bit of a longer walk. Please plan accordingly. The park itself is not large, so our picnic tables should be visible from both east and west parking areas. Please ensure to bring a picnic blanket for your family along with all your picnic essentials. This may include sunscreen, umbrella if you please, etc. Please note there is a sand pit area as well so if you have little sand toys, feel free to bring as well. The park has a wonderful bike ride area designated for kids only. Therefore, feel free to bring their bikes and helmets also. We will have some drinks at hand. We do encourage you to pack plenty of water for your family. We may experience some heat, we want to ensure our kids are plenty hydrated. Light and comfortable for both adults and children! We encourage close-toe shoes for the kids, light pants, and a spring/summer cap to protect them from the sun (that's if your child is likely to wear it for longer than 5 minutes). As for our school t-shirts, new tees will be available for purchase a week prior to our picnic event. Tees are $15 and will also be available for purchase on the day of the picnic. The park does have a restroom area though we noticed it is not always equipped with soap. We encourage you to pack some sanitizer and wipes to ensure clean hands prior to eating. We will have some on hand as well. Get ready to bid ~ your children have been creating masterpieces that they are excited to auction off in our outdoor art gallery/auction. From beautiful canvas paintings that would be perfect for any hallway and bedroom, to crafts and art essentials - we're sure to have something to spark your interest. We’d like to announce that this year’s Silent Art Auction during our Spring Has Sprung Picnic will fund new technology & tools for Big T engineering and science exploration at Harmon Oaks. Last year we raised money for our outdoor play area and garden. We were able to order a number of items last summer that helped us organize our tools and resources outdoors making things more accessible to our children independently, particularly under our outdoor patio-classroom. While our funds were exhausted, we’d still to have a Garden Mud Lab Kitchen. These mud kitchen typically cost anywhere from $800 to upwards of $1000. However, Mr. Harry has promised to construct a garden mud lab for us and we hope to have it before starting our exploration about growth and life cycles in April. The year prior our wishlist was for funding our next picnic's activity & for music and rare-find instruments. We were able to add praying mantis' to this year's "activity" list, as well as having added to our instruments- two accordions, guitars and many many shakers, bells, triangles, etc. Please note, while we'd love to host everyone we most appreciatively consider a part of our family, this event is strictly for the children, siblings and parents of Harmon Oaks families.